I’m a little bit in love with this fashion book. 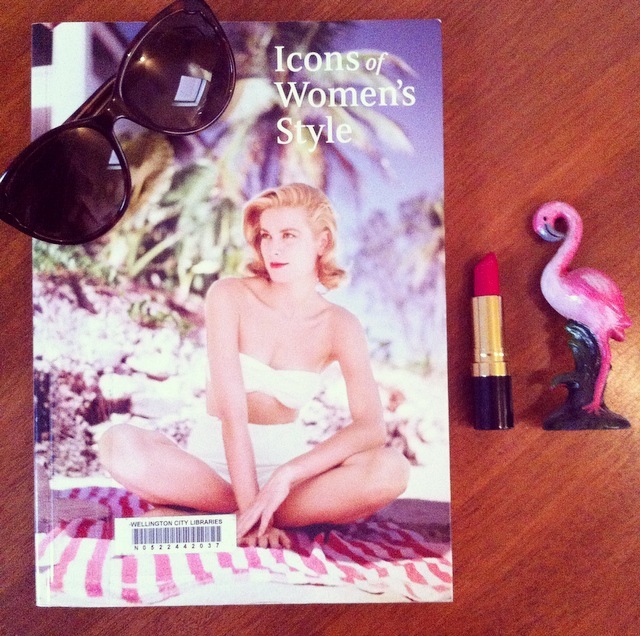 Icons of Women’s Style is about, you guessed it, iconic women’s style! Let this pretty little book whisk you away into the feminine glamour of days gone by. Ooh la la. We’re always adding new books to our Overdrive eBook (and eAudiobook) collection. Here are some highlights! What Color is Your Parachute for Teens. This is a go-to resource for people looking for career advice. As the title suggests, this edition is customised for the needs of teenagers. Note: it’s American, but it has lots of transferable advice! K-Pop Now! : the Modern Music Revolution. It is possible we could have New Zealand’s largest lending K-Pop collection, which is free to borrow for three weeks – just head to the Korean Collection on the first floor of the central library (more titles coming shortly). “K-Pop Now! takes a fun look at Korea’s high-energy pop music…. It features all the famous groups and singers, and takes an insider’s look at how they have made it to the top” (Overdrive). The Suicidal Peanut, Matthew J. Metzger. Well, we couldn’t go past this title! “Life’s not easy when your mum’s nuts, your uncle is becoming your aunt, and one of your crushes could — and probably would — break your face if he found out how you felt about him.That’s Tab’s life, though, malevolent gods and all. His text-flirting with Demi, the brother of his best friend, is going nowhere: Demi already has a boyfriend and anyway, who dates their best friend’s twin? But then, the pining after Nick is going nowhere either, because Nick probably likes gay-bashing on Friday nights for fun. He’s gorgeous, but he’s dangerous, and Tab knows better than that.So what’s a bit of harmless flirting, when one is taken and the other is straight? It’s just a bit of fun.That is until Demi is suddenly single, and Nick is not looking as straight and scary as he was before” (Overdrive). Thieving Weasels, Billy Taylor (eAudio). Cameron Smith is actually Skip O’Rourke, on the run from his con-artist, scamming family. As Cameron, he’s living a great scam-free life, until he’s tracked down by his uncle and ‘convinced’ to take part in one last con. This could get messy. The Raven King, Maggie Stiefvater. We have the last book in the popular Raven Cycle in both eBook and eAudio. For more Overdrive materials visit the Teens eReading Room. This week we highlight three books we’ve ordered recently that have been getting really good ratings on Goodreads; not surprising really, since they look amazing! Outrun the Moon, Stacey Lee. Our library supplier suggests that if you loved Code Name Verity (which we did!) you should have a look at this one. Okay! Set in San Francisco in 1906, Outrun the Moon tells the story of Mercy Wong who manages to get a place at a prestigious school, only for life in the city to be completely changed by the great San Francisco earthquake. With the city under martial law, Mercy proves herself to be a person of action and initiative, helping her community survive the tragedy. Suffer Love, Ashley Herring Blake. This is perfect for “fans of Susane Colasanti, Kasie West, and Lauren Barnholt,” says our library supplier. A love story about Hadley and Sam, who find each other (even though they really aren’t looking) in the midst of their complicated family upheavals. Surrounded by hurt, betrayal and secrets, can their growing romance survive? Not only is the city a disaster, but Nora has troubles of her own: her brother, Hector, is growing more uncontrollable by the day, her mother is helpless to stop him, and her father is so busy with his new family that he only calls on holidays. And it doesn’t stop there. The super’s after her mother to pay their overdue rent, and her teachers are pushing her to apply for college, but all Nora wants is to turn eighteen and be on her own. There is a cute guy who started working with her at the deli, but is dating even worth the risk when the killer especially likes picking off couples who stay out too late? First lines: Mr. MacInerney drives way too slow, which is weird for a man who spends his life running into burning buildings. It could be that being a fireman has made Kathleen’s dad a safety freak, but I think it’s really that he likes to show off his Impala. Eight years ago, Addie Webster was the victim of the most notorious kidnapping of the decade. Addie vanished—and her high-profile parents were forced to move on. Mark Webster is now president of the United States, fighting to keep the Oval Office after a tumultuous first term. Then, the unthinkable happens: the president’s daughter resurfaces. Addie is brought back into her family’s fold…but who is this sixteen-year-old girl with a quiet, burning intelligence now living in the White House? There are those in the administration who find her timely return suspicious. When a national security advisor approaches Darrow Fergusson, Addie’s childhood best friend and the son of the president’s chief of staff, he doesn’t know what to think. How could the girl he’s missed for all these years be a threat to the United States? Still, at the risk of having his own secrets exposed, Darrow agrees to spy on Addie. He soon realizes that his old friend is much more than the traumatized victim of a political fringe group. Addie has come with a mission…but will she choose to complete it? First lines: Darrow had her. He finally had her. Addie Webster was going down. The two sat cross-legged on the floor of the playroom, a game of Connect Four perched between their almost-touching knees. First lines: This is the truth. The whole truth. Nothing but the truth. I was seventeen, it was weeks from graduation, and was crouched behind a foldout couch, crushing a pile of pizza boxes and trying not to gag from the smell. Just know from the start that it wasn’t supposed to go like this. All we wanted was to get near them. That’s why we got a room in the hotel where they were staying. We were not planning to kidnap one of them. Especially not the most useless one. But we had him—his room key, his cell phone, and his secrets. We were not planning on what happened next. We swear. (Goodreads). First lines: People have called me crazy. It’s understandable; fangirls get a bad rap all the time. They say we’re weird, hysterical, obsessed, certifiable. But those people don’t understand. Sheils is very pleased with her perfectly controlled life (controlling others while she’s at it). She’s smart, powerful, the Student Body Chair, and she even has a loving boyfriend. What more could a girl ask for? But everything changes when the first-ever interspecies transfer student, a pterodactyl named Pyke, enrolls at her school. There’s something about him—something primal—that causes the students to lose control whenever he’s around. Even Sheils, the seemingly perfect self-confident girl that she is, can’t keep her mind off of him, despite her doting boyfriend and despite the fact that Pyke immediately starts dating Jocelyn, the school’s fastest runner who Sheils has always discounted as a nobody. Pyke, hugely popular in a school whose motto is to embrace differences, is asked to join a band, and when his band plays at the Autumn Whirl dance, his preternatural shrieking music sends everyone into a literal frenzy. No one can remember what happened the next day, but Shiels learns that she danced far too long with Pyke, her nose has turned purple, and she may have done something with her boyfriend that she shouldn’t have. Who’s in control now? (Goodreads). First lines: It started as a speck in the east, a hint of black that might have easily been a crow. The sky was full of crows in late September, crows by the thousands with their squawking, nervy calls, the way they would mass on a strand of lead-losing trees, a fractured black cloud of them. Dill has had to wrestle with vipers his whole life—at home, as the only son of a Pentecostal minister who urges him to handle poisonous rattlesnakes, and at school, where he faces down bullies who target him for his father’s extreme faith and very public fall from grace. He and his fellow outcast friends must try to make it through their senior year of high school without letting the small-town culture destroy their creative spirits and sense of self. Graduation will lead to new beginnings for Lydia, whose edgy fashion blog is her ticket out of their rural Tennessee town. And Travis is content where he is thanks to his obsession with an epic book series and the fangirl turning his reality into real-life fantasy. Their diverging paths could mean the end of their friendship. But not before Dill confronts his dark legacy to attempt to find a way into the light of a future worth living. (Goodreads). First lines: There were things Dillar Wayne Early Jr. dreaded more than the start of school at Forrestville High. Not many, but a few. Thinking of the future was one of them. Dill didn’t enjoy doing that. Johnny Shoebridge has just returned from fighting in the jungles of Vietnam. He no longer carries a weapon – only photos of the dead and a dread of the living…Pursued by a Viet Cong ghost-fighter called Khan, Johnny makes one last stand – knowing that if he cannot lay this spectre to rest, he will remain a prisoner of war for ever.(Goodreads). First lines: They’d played Samurai all summer holidays, Johnny remembered, like the show on TV. Long sticks for swords. Short sticks for star knives. And that Aboriginal kid, David, who was staying at someone else’s house for a month, played the game harder than anyone else. In the small town of Sand, populated by gunslingers and surrounded by endless desert, Imma washes dishes and grieves for a life she never had. She and her brother, Nikko, dreamed of escaping to become bullet catchers, a legendary band of outlaws who can deflect bullets with their hands. But they were wiped out years ago, Nikko with them. And leaving is impossible when walking into the desert means certain death. When she sees a stranger catch a man’s bullet and turn it back on him, Imma knows it can only mean one thing: the bullet catchers live on, and this is her way out. Determined to follow him, Imma starts a journey that will take her to her physical extremes and force her to question just what family means and who she really is: bullet catcher or gunslinger; hero or monster. (Goodreads). First lines: It’s late at night when the memory comes for me, like it always seems to when the relief of sleep seems ready to draw me under. The fire. I recall it as a heat on my face, a deep, quickened voice that might be my father’s, my brother’s skinny arms around me, the glass of the windows blowing out, explosions that for the longest time I thought were fireworks. When her mother is knocked down and killed by a London bus, fifteen-year-old Melon Fouraki is left with no family worth mentioning. Her mother, Maria, never did introduce Melon to a ‘living, breathing’ father. The indomitable Auntie Aphrodite, meanwhile, is hundreds of miles away on a farm in Crete, and is unlikely to be jumping on a plane and coming to East Finchley anytime soon. But at least Melon has ‘The Story’. ‘The Story’ is the Fourakis family fairytale. A story is something. (Goodreads). First lines: This is the recipe. Take five pounds of hulled whole wheat. Hold it in your arms. Feel that it weighs nothing compared to the load that lies heavy on your heart. Wash the wheat; let your tears join in. Seventeen-year-old Anouk has finally caught the break she’s been looking for—she’s been selected out of hundreds of other candidates to fly to France and help with the excavation of a vast, underground palace buried a hundred feet below the suburbs of Paris. Built in the 1780’s to hide an aristocratic family and a mad duke during the French Revolution, the palace has lain hidden and forgotten ever since. Anouk, along with several other gifted teenagers, will be the first to set foot in it in over two centuries. Or so she thought. But nothing is as it seems, and the teens soon find themselves embroiled in a game far more sinister, and dangerous, than they could possibly have imagined. An evil spanning centuries is waiting for them in the depths…(Goodreads). First lines: I heard it being built. Father’s secret Versailles, a palace beneath a palace. A world of gilt and crystal hidden deep within the roots of France. Here’s some nonfiction titles we’ve received recently, or are coming soon, proving there is some interesting goodness in the YA nonfiction collection! The Gutsy Girl: Escapades For Your Life of Epic Adventure, Caroline Paul. Read this book and you may find yourself doing something completely mad and hair-raising and crazy… or something. “…A book about the glorious things that happen when you unshackle from fear and open up to exhilaration” says Goodreads.com. Yeehaaaaa. Fight Like a Girl: 50 Feminists Who Changed the World, Laura Barcella. An introduction to the history of feminist activism in the United States, featuring, as the subtitle suggests, 50 short biographical pieces of noteworthy women. Feminism: Reinventing the F Word, Nadia Abushanab Higgins. More on the topic! This Book Loves You, PewDieDie. Inspiration from the Swedish online comedian. Quiet Power: The Secret Strengths of Introverts, Susan Cain. Being an introvert can get a bad rap, but this book may change your perspective on quiet people and what it means to be one. Can you be a loud introvert? Maybe, for short spaces of time, on special occasions. This May Sound Crazy, Abigail Breslin. Abigail Breslin is a successful actor who starred in Little Miss Sunshine, My Sister’s Keeper, Ender’s Game. This is a collection of essays about life in the digital age.